DAILY MAIL and I thought I'd share it with you here. stepped in to prove that a dog's best friend is...another dog. his fellow Jack Russell terrier to guide him everywhere. his head on her when he becomes tired or disorientated. his sight, Lilli became his guide dog. 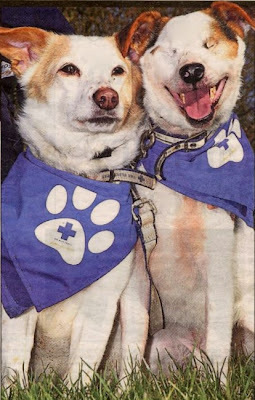 the dogs had to be re-homed together. understanding, which is quite amazing to see. a loving new home by now. movie proclaim it to be the best superhero movie since SUPERMAN in 1978.
looking forward to seeing if Thor can truly measure up to such fulsome praise. sequences in Superman still hold up pretty well, even after all this time. 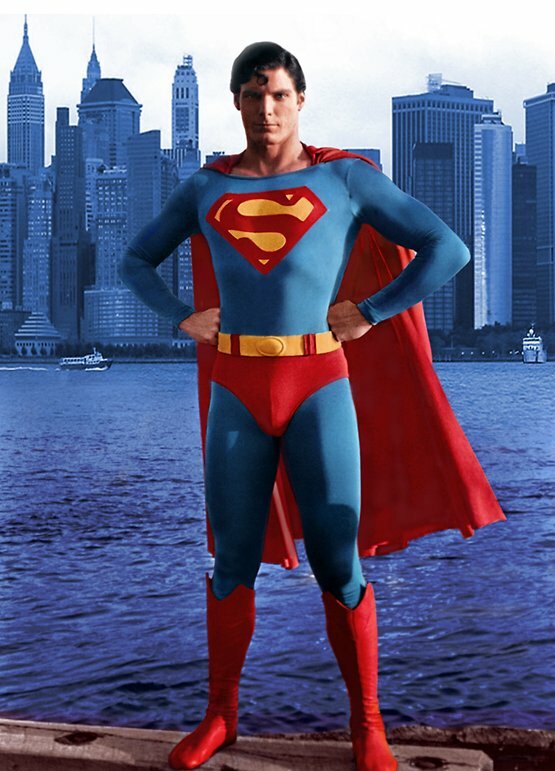 CHRISTOPHER REEVE's interpretation of The MAN Of TOMORROW. personation of Reeve, but failed to truly match the original. greatest superhero on the big screen. I was wandering through my local JOHN MENZIES (now WH SMITH'S) one Winter's day back in 1976, when I spied a big square table laden with a selection of annuals. Prominent among them was one I hadn't seen before, although the art style was familiar to me. "Only £1? ", thought me - "I'm having that!" And thus was I introduced to legendary British cartoonist LEO BAXENDALE's latest comic creation - WILLY The KID. According to the 1st annual, there was going to be a new one every year, and each book would be kept in print forever. 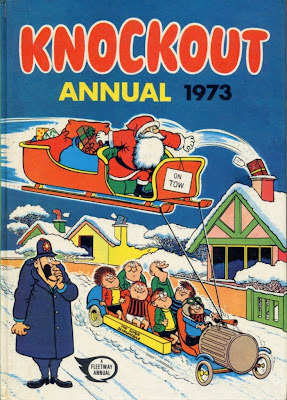 When the 2nd annual came out in 1977, I snapped it up and gleefully looked forward to the next one in what was going to be a yearly succession of Willy the Kid publications for all eternity. I was deliriously happy. Experience has long-since taught me that nothing is ever that easy and that the fates often conspire against us, but back then I was still an optimist. 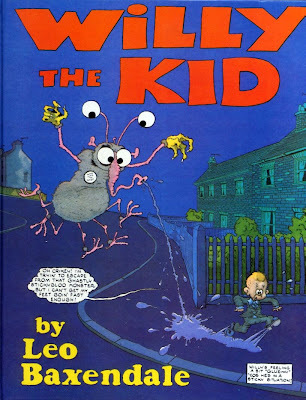 ﻿﻿In 1978 I bought Leo's autobiography, A VERY FUNNY BUSINESS, but, apart from a picture on the back cover, I simply couldn't find a copy of the 3rd annual anywhere. (Many years later, a dealer told me not to waste my time looking for it as it had never been printed. That would certainly explain why I couldn't find a copy at the time.) 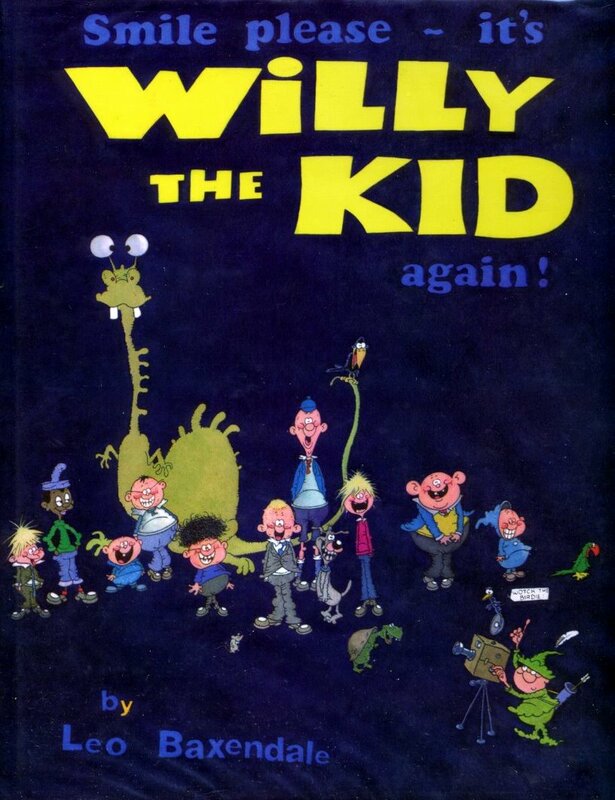 I never saw a Willy the Kid Annual again - he had simply vanished from the face of the earth without even saying goodbye.
" 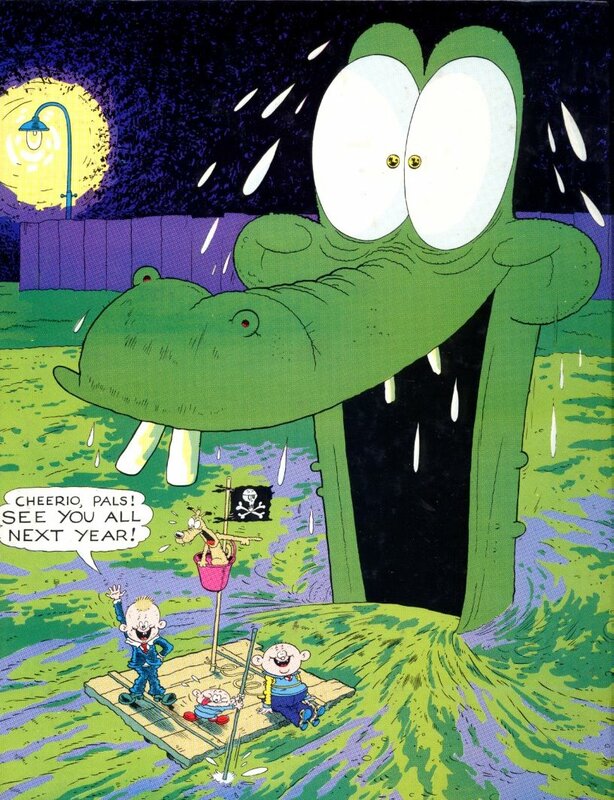 - what's more, the print orders for Willy Books 1 and 2 were in both cases circa around 150,000, and they were sold along with the other annuals (Beano annual and whatnot), but the print order for the third Willy book, being a 'posh' book, had a print order of 10,000, and was tucked away in bookshops, instead of being sold alongside annuals." So there you have it from Leo himself - the book was published - and don't let any dealer ever tell you different. Bax then went on to say the following: "So, alas, alas... lots of dedicated readers couldn't find it, and in many cases have spent the rest of their lives looking for it (funnily enough, the day before I received your order, I'd had an order for prints and books from a young man in Catford in London, with a covering letter telling me jubilantly that only the previous week, he had finally found a copy of the elusive Willy the Kid Book 3 in a junk shop in Wales.) So never give up hope." I eventually managed to track down a copy of the book on the Internet in 2009. 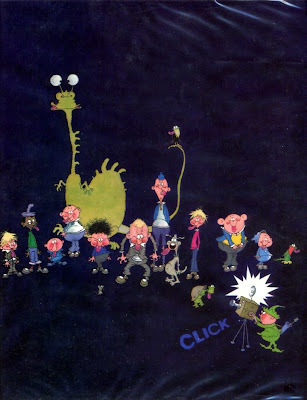 It may have taken me 31 years, but I can now finally boast a complete set of 1970s Willy the Kid Annuals. 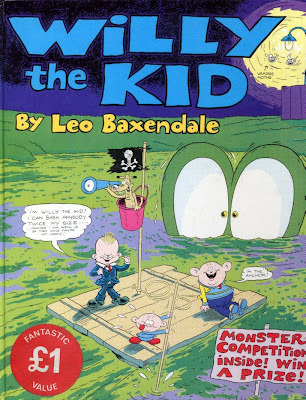 They're well-worth having, although the third book has fewer pages than its two predecessors. Incidentally, the 'ripples' in the accompanying photographs of Book 3 are on the protective clear sleeve, not the dustjacket itself. I wasn't going to risk damaging it by removing it to scan. Never printed? Well, what's this then? 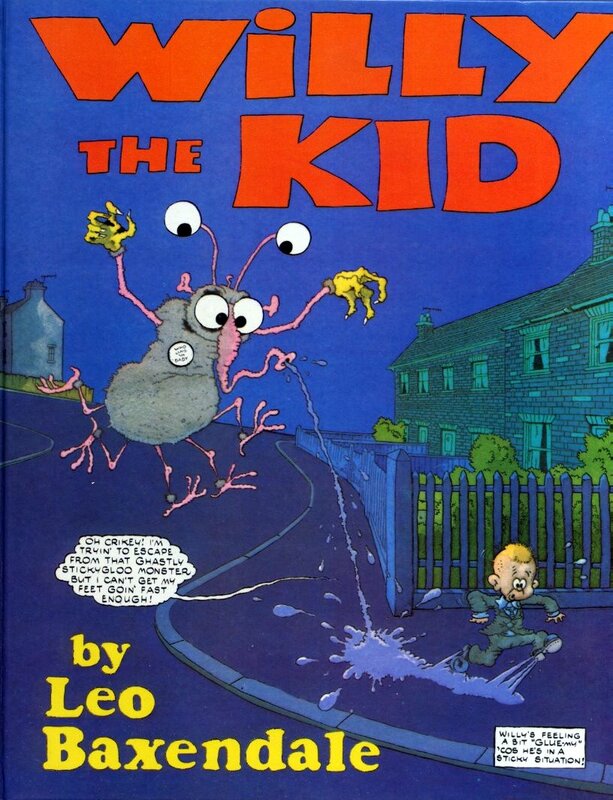 If you're wondering why the annuals didn't continue, the matter is touched on in Leo's book, The BEANO ROOM & Other Places, doubtless available from eBay and second-hand booksellers. Why not track down a copy today? Incidentally, several letters and notes which Leo sent to me over the years appear on various posts on the blog, so if you want to see into the mind of the great man, use the search box to locate them, by simply typing in Leo Baxendale. of something you can't see? which hit the shops later than the others. late morning or early afternoon. year right up until 1984 (for '85). Anyway, enjoy the cover - it's a window into yesteryear. "THEN THEY MASH THEM ALL TO BITS..."
took this picture in my back garden. 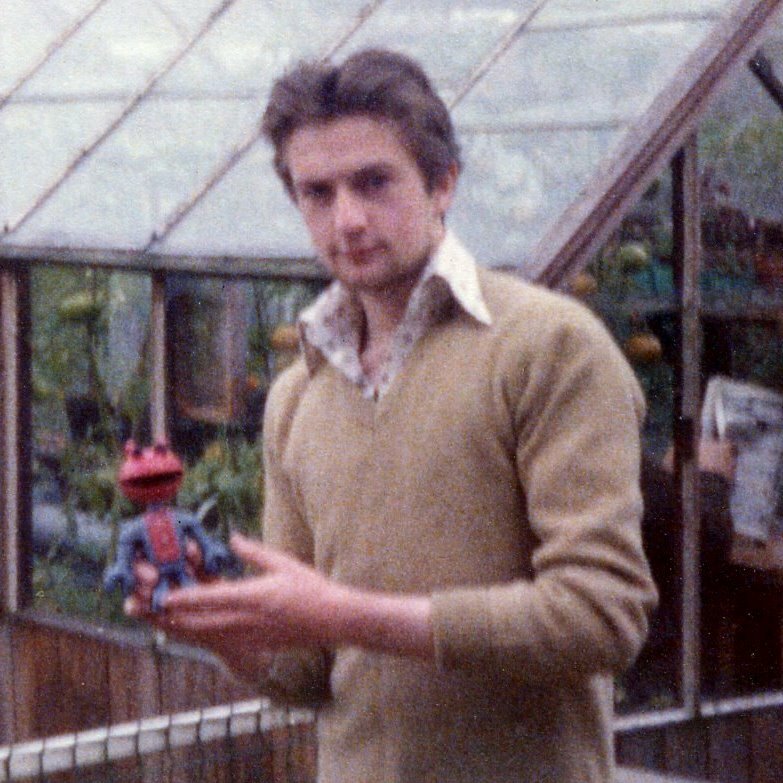 Martian today, over 34 years later - in perfect condition too. but I'll let you figure it out for yourselves. own. So, with a little editing, here it is for your consideration. 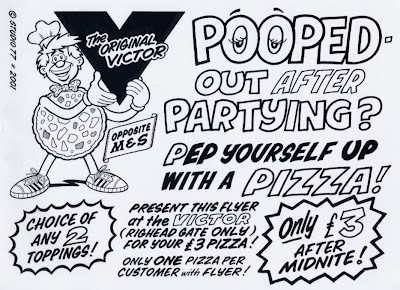 U.K. comics. 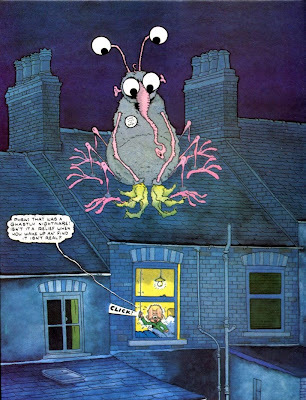 One such comic was (and still is) a cult comic in Britain. logos, etc. That's why I worked for them. rather than being a part of it. letter them the best and most effective way they could be done. people thinking we're them." Crazy or what? the fault of the actual contributors. 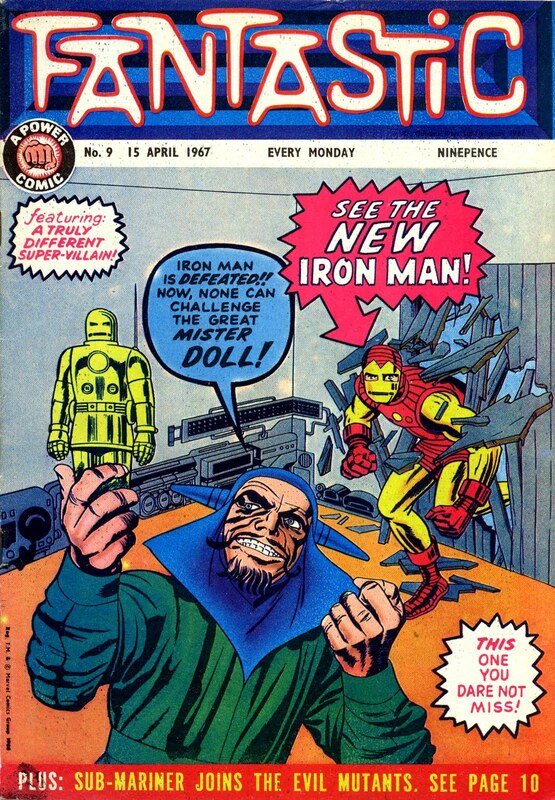 to the month of April, in the year of our Lord, 1967.
the same, or am I just bonkers? have hurt you to lie just this once? "BIG JOHN, BIG JOHN - BIG BAD JOHN..."
and perhaps even eclipse Kirby to some extent with the result. had once been the case? 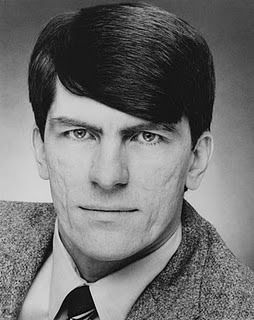 I've just discovered Jaunty JIM SHOOTER's blog over at http://www.jimshooter.com/ - fascinating reading to be had by everyone on all matters pertaining to comics. 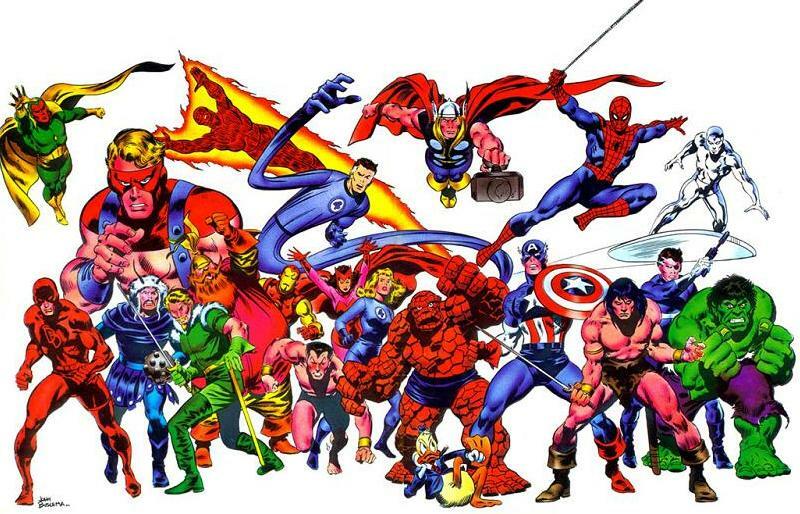 One-time head honcho at MARVEL, Shooter is a controversial figure to some fans and pros in the industry, but - love him or hate him - there's just no ignoring what he has to say on the subjects ﻿of comics and their creators. In my opinion, Jim seems to be a decent and honest guy, and some people may be surprised at his actual involvement behind the scenes of certain things for which he appears to have been unfairly castigated. Read his account of his role in the KIRBY/MARVEL/ARTWORK dispute, and many other interesting comics-related topics at the above link. 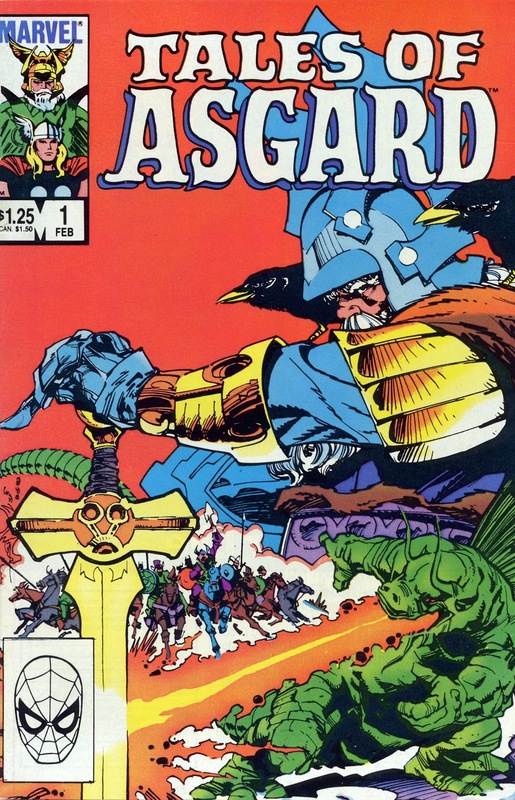 Back at the end of 1983 or beginning of '84, I purchased TALES Of ASGARD Volume 2, Number 1, with its beautifully rendered WALT SIMONSON cover, and determined one day to acquire Volume 1, Number 1 of the self-same title. 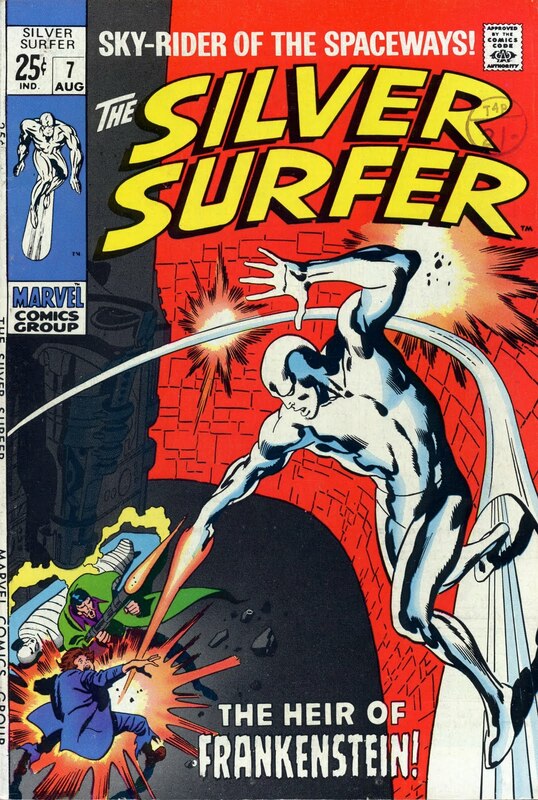 That issue had been published in 1968, and it's possible I had seen it in some back issue comic shop in the intervening 15 or 16 years between both volumes, but, if so, I'd never felt the need to own it at that time. Now, of course, I couldn't have the second one without also having the first. 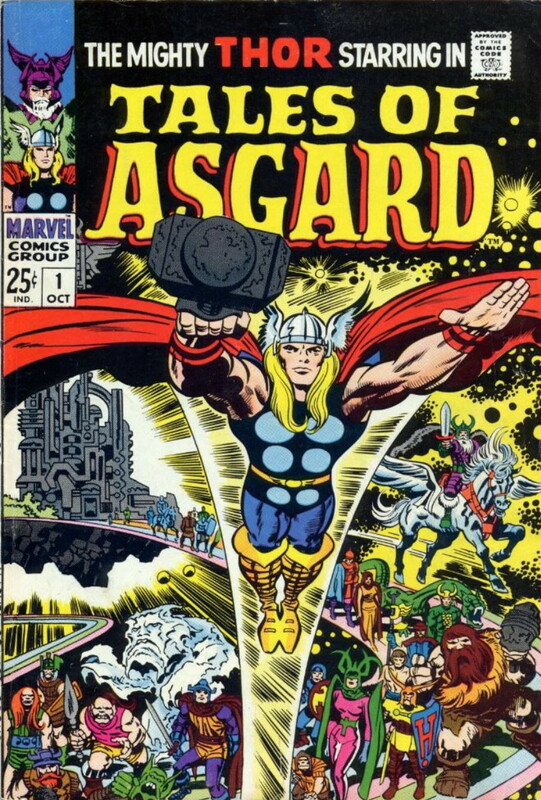 The years came and went without me ever obtaining the aforementioned classic, but a year or so back, MARVEL published a 6 issue series of all the Tales of Asgard stories - and then released them in a hard-cover Omnibus-sized book. (It's just been released in a standard-sized softcover edition also.) I now had all the stories in their restored and re-coloured glory, not to mention a few of the original THOR comics in which some of them first appeared. What need now had I of the original 68 page 1968 comic? 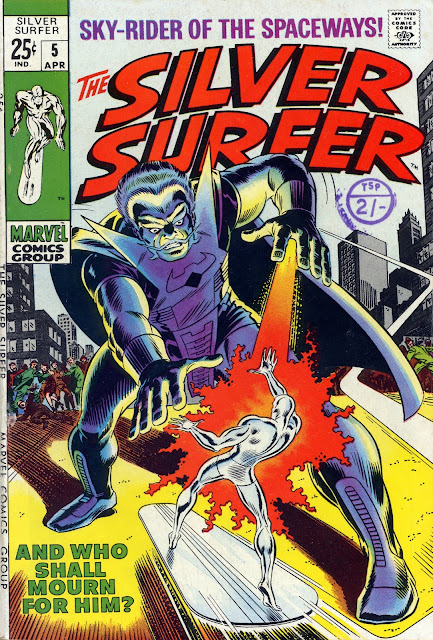 If it was anything like the 1983/'84 special, the artwork suffered from line drop-out on VINCE COLLETTA's fine inking, rendering the printed pages far less detailed than their original back-up appearances in Thor's own monthly magazine. Well, the answer is obvious - none, really. So when I spied the coveted issue on sale on eBay recently, I must've hesitated for all of two seconds before snapping it up it to add to my already vast collection. What can I say? Only other rabid collectors will fully understand the need to fill that missing gap in a run - even if you already have other presentations of the contents. I now have the MASTERWORKS editions, as well as the AVENGERS UNITED printings (a U.K. publication), the recent re-coloured 6 issue series, the THOR OMNIBUS, the MARVEL SPECIAL EDITION issues, the hardback book, the 1984 Walt Simonson covered comic - and now I have the '68 Special as well. (Only 27 or 28 years after I first decided to one day make it my own.) 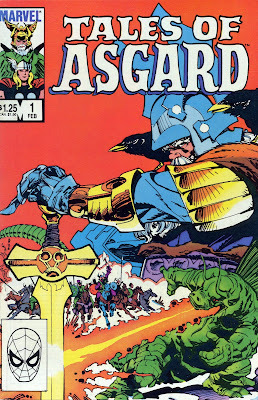 I have every Tales of Asgard story ever printed, in either partial or complete presentations of these mini-classics. 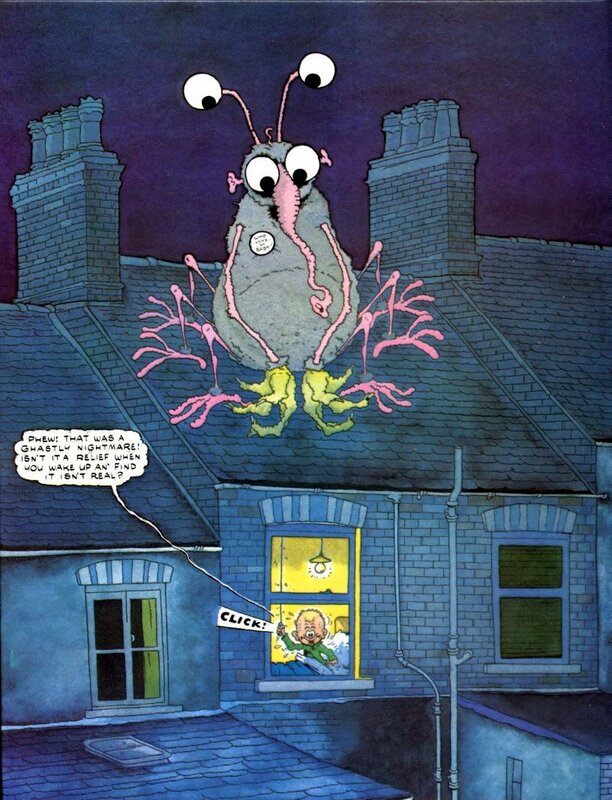 Surely now I can draw the curtains on that particular compulsion to have a complete set of these stories? You'd think so, wouldn't you? 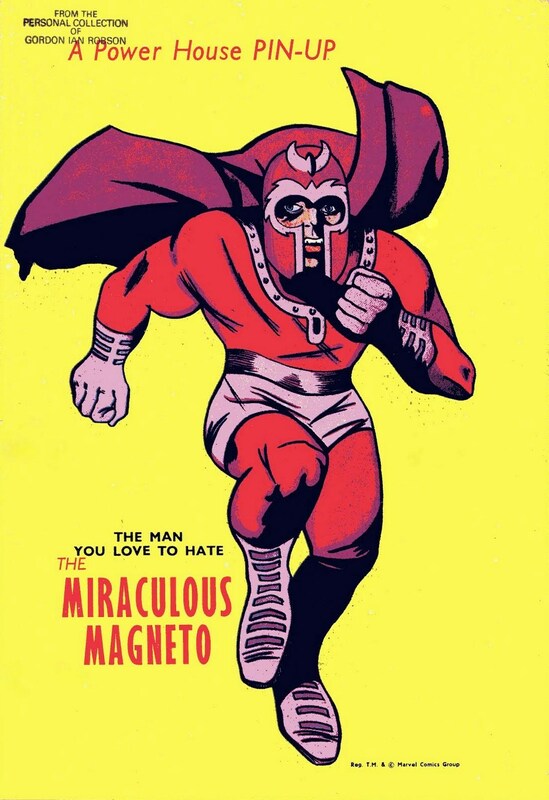 But I'm finding that recently released softcover edition mighty tempting. Will someone please save me from myself? 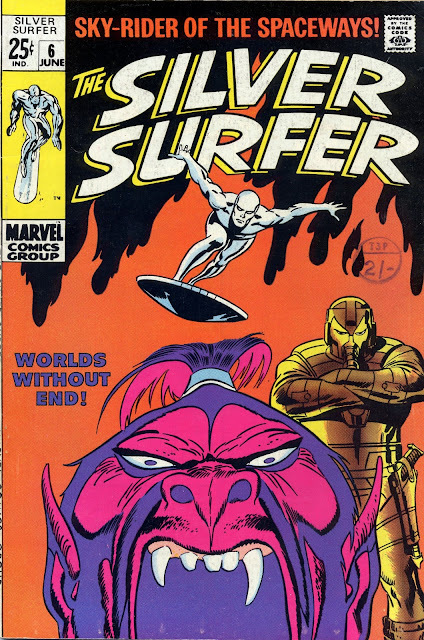 "NORRIN RADD, NORRIN RADD, RIDING THROUGH THE GLEN..."
King-Size Surfers - next time up, I'll feature the 36 page issues. illustrating ol' Norrin's own magazine - in my humble opinion. 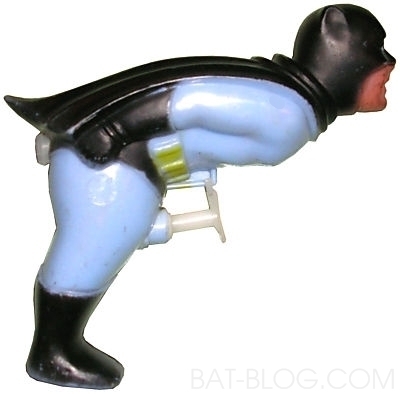 Take a look at this 1960s BATMAN water-pistol. I feel just a little ashamed at my loss of innocence in seeing something that I never noticed as a child, but was the designer having a laugh when he placed the stopper and trigger at Batman's embarrassing bits, or was he as oblivious to the comedic ramifications as the thousands of kids who had this cheeky toy back in the day? Whaddya think, fellow Criv-ites? Completely innocent - or is he feeling a strange stirring in his utility belt?